The Irish talent and tradition for spinning a yarn found its way to Giant’s Causeway on the rugged coast of Northern Ireland. 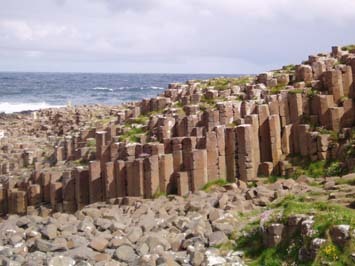 Legend has it that the giant Finn McCool caused the geological phenomenon of Giant’s Causeway. But, like a few Irish stories floating around, this one has two versions. Take your pick. McCool, who commanded the king of Ireland’s armies, took a fancy to a lady giant on an island in The Hebrides (near Scotland). 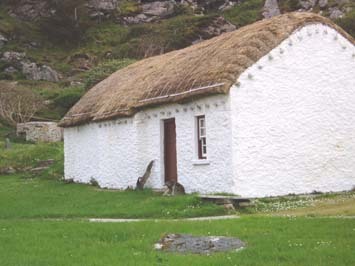 He built the Causeway so he could bring her to live with him in the province of Ulster. Other lore has Finn McCool erecting a path to Scotland to confront his rival, a Scottish giant named Benandonner. In actuality, Giant’s Causeway, a UNESCO World Heritage Site, was formed by the cooling and shrinking of lava as it burst through the earth’s crust about 60 million years ago. A honeycomb of about 40,000 columns, these gigantic “steppingstones” make for a dramatic entry from the cliff foot to the sea. Most columns are six-sided, but some are four, five, seven and even eight-sided, and reach as high as 40 feet. Here, you’ll have an inkling of what the wild, rugged and romantic beauty of the Northern Ireland coastline holds. Jagged cliffs. Crashing waves. Touches of emerald green. This spectacular scenery gives pause to poets, writers, artists and ordinary folks. Inhale and explore the natural splendor of Giant’s Causeway. 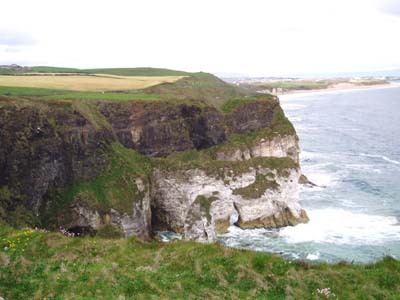 A National Nature Reserve and Northern Ireland’s most popular draw, the site is open year-round. First off, stop at the visitor’s center at the top of the cliff. Take time to watch the short presentation on the scientific theories and local folklore surrounding the Causeway. A gift shop, tea room and picnic tables round out the amenities. You can hike on the 15 miles of footpaths, or take the mini-bus service down the steep incline to Grand Causeway to view the majority of basalt columns. If your eyes are keen, or better yet if you have the National Trust Guide in hand, you can pick out intriguing formations such as the Wishing Well, Giant’s Gate, The Camel’s Back, The Chimney Pots, The Granny, Punchbowl and The Giant’s Boot. At the west end of the cliffs, Portcoon Cave is a large sea cavern you can enter on the landward side. Whatever your path, tread carefully, as the stones are uneven and slippery, the slopes a bit dicey, and big waves may roll in unexpectedly. One of the Signature Project initiatives of Northern Ireland establishes a touring route starting in Belfast and finishing in Derry. Set for completion next summer, approximately 440 signs will mark the Causeway Coast route that goes through the nine Glens of Antrim (home to the surrounding coastline of Giant’s Causeway) as well as a number of visitor attractions. Before you head toward Derry or the vibrant city of Belfast, drive the short two-miles on the Antrim Coast Road to the village of Bushmills. Here, you’ll find the world’s oldest licensed whiskey distillery. King James I granted the original license in 1608, and The Old Bushmills’ Distillery has been making Irish Malt Whiskey ever since. Originally, Bushmills was the last stop for carriages from Belfast before the final push to the Causeway. Passengers disembarked for a respite, and revived themselves on the whiskey. Today, you can take the guided tour, and then sip a complimentary glass of the end product. Browse the gift shop or enjoy a bite at The Distillery Kitchen. Historic Londonderry, or Derry as it’s more often called, remains the cultural capital of the northwest. Earliest references date to the sixth century when a monastery was founded by the Irish Saint Columba. Set on a hill on the curve of the Foyle River not far from the open sea, Derry boasts the only complete city walls left in Ireland. Built between 1613 and 1618, the well preserved walls are marked by four original gates and bastions that remain intact. Access is free to the mile-long city walled area, which also affords great views. Must-sees in Derry include the neo-Gothic Guildhall with superb stained glass windows that illustrated almost every noteworthy event in the city’s history. The Guildhall is still the civic and cultural center for the city’s residents. And, visit St. Columb’s Cathedral, Derry’s most historic structure built in 1633. Derry can be used as a springboard to other parts of Ireland. Its regional airport provides service to London, Glasgow, Manchester and Dublin, with connections to North America. 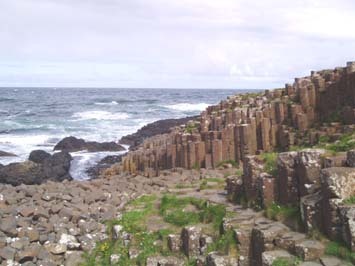 Derry, Giant’s Causeway, the Coastal Causeway and Belfast lie in Northern Ireland. Currency is the British pound sterling, although some places accept the Euro, which is the legal currency used in the Republic of Ireland.